Notes：No built-in battery, powered by power adapter. Tips: This soundbar is NOT for Apple TV 1/2/3/4/4k. Modern appearance with 360 degree spin buttons in front side, easy access to all functions even in dark night. Accept returns or exchanges if you're not satisfied with it for any reasons. Jomay promises to give you a great shopping experience. 【Crystal Sound】: Built-in 4 x 6W drivers and 4x Low frequency passive radiators, distortion-free at maximum volume. 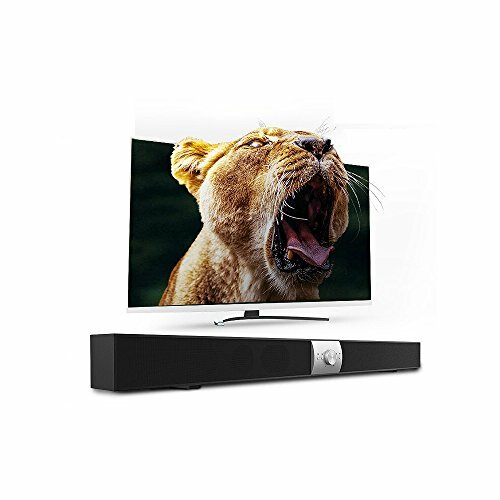 Wider frequency range with rich sounds, super bass stereo soundbar, noise reduction effect, perfect for tv home theater. 【Classic & Wall Mountable Design】: Jomay sound bar (37"x2.6"x3" ) is essentially a slim speaker system which are able to deliver a virtual surround sound experience, and can be mounted on wall easily. 【Multi-Modes for Wireless/Wired Connections】: This Jomay soundbar works with 4 connection modes: Bluetooth (distance:10 meters/33 feet), TF Card, USB Hub and wired connections with 3.5mm AUX input. 【Bluetooth V4.2 Technology】: Compare with 4.0 version, bluetooth 4.2 brings 2.5x faster transmission speed, more safe authentication protocol and lower power consumption. Compatible with Apple iPhone iPad iPod , Samsung HTC Motorola Google android smartphone, and most others devices with bluetooth. 【100% SATISFACTION GUARANTEE】:Jomay bluetooth soundbar has a 100% satisfaction guarantee and 360 days warranty. Jomay is committed to delivering an excellent experience for all buyers. If you have any questions about this product by JOMAY, contact us by completing and submitting the form below. If you are looking for a specif part number, please include it with your message.